It’s that time of year! It is time for the game of games. Time for the last bastion of true amateurism in major college football. Time for the greatest rivalry of them all. It’s time for the Army-Navy Game. There really is nothing like it. Every school has its rivalry games, and those fans all think theirs is the best. But are they any different than every other rivalry? We hate you, you hate us, blah blah blah. Let’s be real here. You have these state schools with 30,000 students. How many of them never set foot in the football stadium? How many don’t really care about the “big game?” At Army and Navy, it’s different. Every one of the 4,000 students at each school is at the game. And the moment those 8,000 students take their first step onto the grounds of West Point or Annapolis, they let out their first of countless “Beat Army” or “Beat Navy” yells. At some schools, you can go all 4 (or 5 or 6) years without having anything to do with their rivalry if you wanted to. That’s impossible to do at Army or Navy. Hell, not only is Navy’s fight song all about beating Army, but we yell “Beat Army!” at the end of our alma mater. Beating Army is at the heart of the Naval Academy experience. If that doesn’t take the cake, I don’t know what would. There was a lot of talk before the Notre Dame game, as there is every year, about how some players say that they want to beat Notre Dame even more than they want to beat Army. I don’t doubt it, at least at the time they say it. I wouldn’t be surprised if Army’s players felt the same way before their game in South Bend last year. But after the Army-Navy game, when the teams line up for each school’s alma mater, ask the same question– especially to the team who sings first. There won’t be any doubt then. Army week has supposedly been put on hold at USNA as this mideast peace conference takes place. I guess we don’t want to set off an international incident by doing a wildman on some Palestinian diplomat. West Point doesn’t have the fetters of world peace with which to be burdened, however. Their antics are apparently in full swing as a Youtube slideshow shows that they have either stolen Bill or put together a pretty good hoax. Assuming it’s a hoax, I have to tip my cap to the Woops. That’s a level of creativity that we’ve never seen from Hell on the Hudson before, considering that their typical spirit spot consists of some random Army unit gathered around a sign and yelling, “We’re the X platoon in some company in some random part of the country! Go Army! Beat Navy! Hooah!” Hey, the submarine force might be nerds with their animated goats-from-under-the-sea cartoon every year, but at least they’re creative nerds. At first, it seems like Brock is trying to be complimentary. And he is, in a way. He says that Navy is well-coached. Fine… but it isn’t his point. What he’s really saying is that Paul Johnson’s offense has limitations. That it can’t win at the highest level. That it holds Navy back. Bad move, Stan. The last time we heard something like this it was from UConn coach Randy Edsall, who made a few comments after the 2002 game that hinted that maybe he had “solved” PJ’s offense. 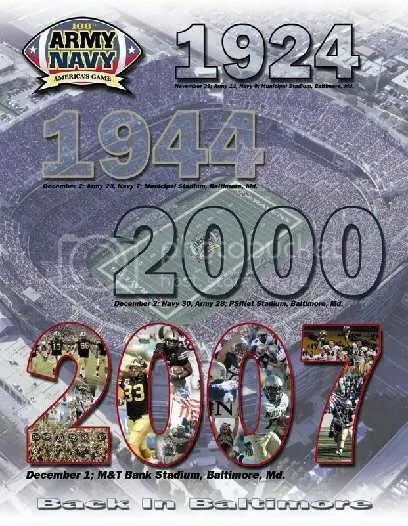 When the two went against each other 4 years later, Navy piled on 605 yards of offense in a 41-17 win. I don’t think anything motivates Paul Johnson more than when someone gives his offense a backhanded compliment. Brock might as well have told a yo momma joke. Motivational hoopla aside, Army probably feels as if this is the best shot they’ve had to knock off Navy in a few years. Kaipo might not be at 100%, and the Black Knights’ defense played a pretty decent game against him last year. Kaipo did have a bit of a deer-in-the-headlights look about him in the 2006 game, but in case his crowd-pumping at the Notre Dame game didn’t tell you, that isn’t really an issue this year. That doesn’t mean he’ll be sharp after sitting for so long, though. And to top it all off, the much maligned Army offense is coming off of its best performance of the season. Army is 115th in the country in total offense, averaging a meager 280 yards per game. Against Tulsa, though, the Black Knights came alive to the tune of 491 yards and 39 points. Quarterback Carson Williams was 26 of 38 through the air for 328 yards and 3 touchdowns. The primary beneficiary of Williams’ performance was wide receiver Jeremy Trimble, who caught 11 of those passes for 167 yards and two touchdowns. Even the Army running game managed to almost double its usual output, churning out 163 yards. One look at that performance and Army fans have to be wondering where the hell that offense had been all year. I’m not sure what the answer is. I have a guess, though. The strength of Army’s team this year is its defense. Their strategy has been to play conservatively on offense and limit mistakes, using their defense to keep games close and hoping to pull out close ones in the 4th quarter. It worked in a few games. That’s how Army beat Rhode Island and Tulane, and they played tough contests with Akron and Wake Forest. They also managed to hang with Georgia Tech for a half, and defense & special teams were what won the Temple game. But for the most part, Army’s offense was so conservative that they ended up with a bunch of 3 & outs that kept their defense on the field too long. They would get tired, and the game would slip away. After a 3-3 start, Army’s defense has worn down and given up at least 30 points in each game of the Black Knights’ current 5-game losing streak. When Tulsa rolled into Michie Stadium two Saturdays ago, I think Stan Brock felt he had to try something different. With his defense reeling and the #1 offense in I-A coming to town, Brock probably didn’t feel like he could stop the Golden Hurricane. My guess is that he figured his best bet would be to turn the offense loose and try to outscore them. And it worked better than just about anyone could have hoped. Army’s usual offensive game consists of passes to the flats and running between the tackles, with stud fullback Mike Viti leading the way. Against Tulsa, Army came out with a completely different look. They stretched the field, both vertically and sideline-to-sideline. Trimble was able to finally use his speed on something other than a kickoff return, bringing in a 57-yard reception and a 35-yard TD catch. Army’s running game was a lot more horizontal, as the offensive line did a good job with zone blocking on “stretch” plays. Army defensive coordinator John Mumford has gone with a 4-4 scheme against Navy each year since he was promoted to the position in 2004. In 2004 and 2005, it resulted in 42 points apiece for the Mids. Last year Army played much better, but Kaipo also had his worst game since taking over as starting quarterback. The Woops went after the then-sophomore in much the same way that Rutgers did earlier in the year. But Kaipo is not the same quarterback he was that day. It will be interesting to see if Mumford takes the same approach. My guess is that he will, and I think he will pay for it. So what does it all mean? Navy shouldn’t have much of a problem moving the ball, but Army does have a legitimate I-A defense. If Kaipo is shaky after his time off, Army is good enough to capitalize and force turnovers. Execution is the key to the game for the Navy offense. As for Army, it really all comes down to how Stan Brock sees this game. Navy is second only to Tulsa in total offense among Army’s opponents this year. Does Brock recognize this and choose to open up his own offense the way he did against Tulsa? Will Jeremy Trimble be cut loose in the Navy secondary? If so, it could be a very interesting game. On the other hand, if Brock has confidence in his defense after the way they performed last year, and if he really feels that Navy’s offense isn’t “well-rounded” enough to be a threat, then we might see the same conservative game out of the Army offense that we’ve seen all year. And if that happens, then Navy will have the first 6-game winning streak in the history of the Army-Navy series. Here’s hoping it happens. Beat Army! If Kaipo is the least bit shaky-pull him for JB in a NY minute. Despite it all the fact is Navy must/should win the game which shows them about right by 2 touchdowns. Yet-this year any Navy fan will still be a bit scared to see what happens when Armys QB drops back to pass. Please tell me that Buddy Green has done something in 2 weeks to enable the Mids to get pressure on the QB? Gary, you’d pull Kaipo if he sneezed on the sideline. Is it ok to criticize a host city before even getting to the game? Philly has a great site for all the information one needs to attend the game when it hosts it, but Baltimore has squat to help with gameday stuff. If I’m wrong, please let me know. I was one of the Goat Handlers in 95 when Army stole Bill. Trust me, we were happy to have someone else take care of that ornery SOB.